In this article, we will show you the relationship between Theme Options, Preset and Page Options and How to use them to create your website. These Options are the backbone of these themes: ORION, MOVECO, MOWASALAT, RICA, ARVO .They give you full control over your website and allow you to customize the design without touching a single line of code. – Page Options: Located within each page and post. 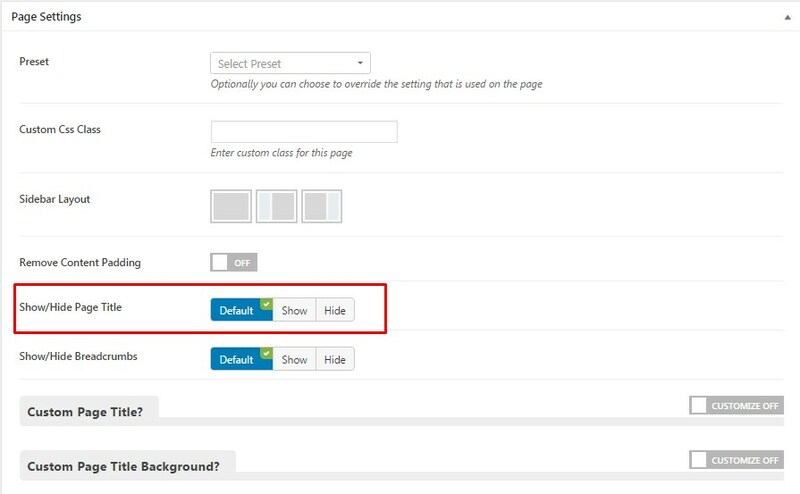 Page Options will only affect the individual page you change them on and overrides options set in the Theme Options. – Preset are Page Options that were set beforhand to facilitate use, and overrides options set in the Theme Options. – Theme Options : Located in WP Dashboard > G5Theme > Theme Options these options are global options that affect your entire website. NOTE: Preset and Page Options will use the Theme Options value if left empty or if the value is default. They will override Theme Options if any other value is entered. This setup gives users maximum flexibility for setting a global theme option, then being able to override it on a page/post/shortcode basis. Please see below for an example of an option that has both a theme option and a preset. If you choose default for a page option, it will use the selection you have made in Theme Options. Select a different value to override the theme option. Below is a screenshot of the Top Bar section in Page Options. 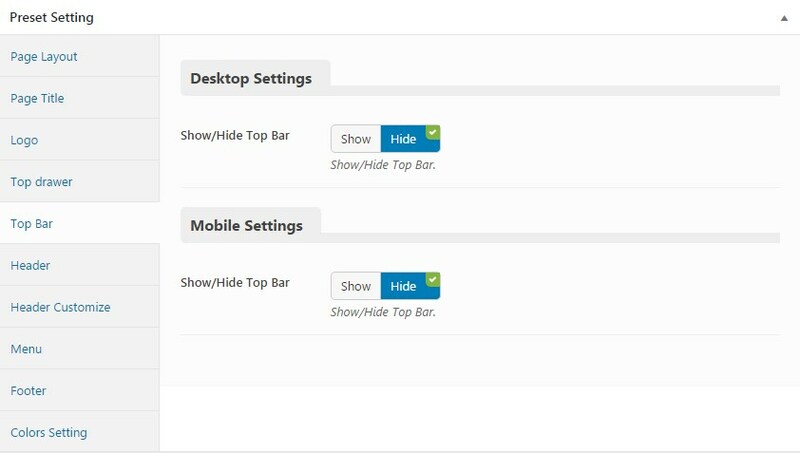 The Show/Hide Top Bar option is set to Hide, which means on any page apply this preset, you are overriding the same global theme option and your Top Bar will be not display. If you choose default value in Page Options, it will use the selection you have made in Preset or Theme Options. Insert a different value to override the Preset or Theme Option value. Below is a screenshot of the Page Title section in Preset. 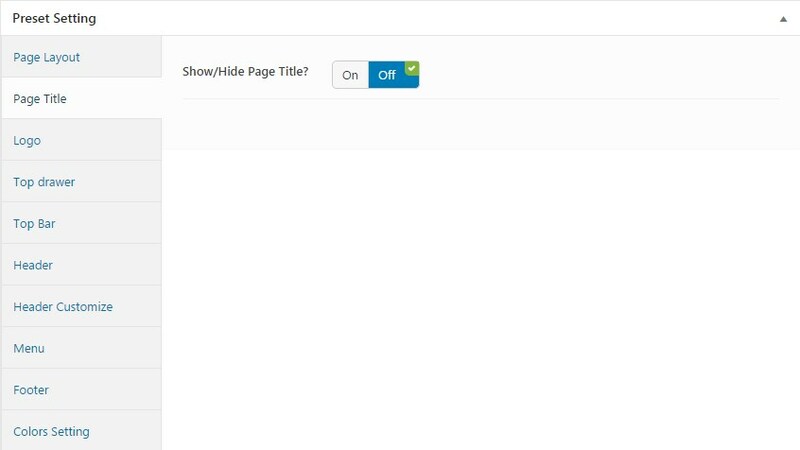 The Show/Hide Page Title option is set to Off, thereby on any page apply this preset will be not display Page Title unless the corresponding option in Page Options is set other value. Below is a screenshot of the Page Title section in Page Options. The Show/Hide Page Title option is set to Default, which means that it will use the value you have set in Preset (if this page apply any Preset) or Theme Options. Insert a different value to override the Preset/ Theme Option value. If you have any troubles configuring your website applications with the above settings you can contact the G5Theme Support Team by signing up and submit a new topic. G5Them Support Team will be glad to assist you.